Service life can be thrilling, fast paced and all about the right here, right now. No time to worry about money matters! Time goes by and that thinking becomes a habit which may be hard to break. Don’t make that mistake. The future is in your hands and only you (and your family) can make the decisions and take the actions that will build a sure financial foundation for the future. Here’s what to watch out for and what you could do about it. You think your life is going to follow a pattern because you have a routine and a plan for what you’re going to do. Then something ‘off plan’ comes along – a posting, an accident, a baby! Take out an accident or health policy and consider life insurance. Get some professional financial advice at the start. For help with the tricky stuff, like life and health insurance, have a look at websites such as The Royal British Legion, MOD endorsed MoneyForce or try the Money Advice Service. It’s not only about emergencies. As the years roll by, you may have a little more money and enjoy spending it. Why not? But saving money isn’t just about the big costs, it’s about being ready to deal with all kinds extras. Get into the habit of saving, no matter how little. Do it the easy way – set up a direct debit. Make sure you are using a tax-free savings plan, like an ISA, so you get the full benefit. See this great article from Martin Lewis on Money Saving Expert for more info. Top tip: Try to save at least half of your Opt tour bonus – that way, you’ll have some easily accessible savings for when you really need the cash. Forces pension schemes are an excellent way to look out for your retirement but what about your partner? Pensions for spouses can be over-looked. Don’t assume one person’s military pension will be sufficient. Start as soon as possible. If you can afford to put a bit more in, do it now. The longer the money is in a fund, the more it will be give you as a pension. Take a look at the Forces Pension Society website. Learn more about the different types of pensions – click here for further info. When Serviced Families Accommodation are readily available you may put off buying a property of your own, or planning for it. However, owning a house can be an investment and gives you long term security. 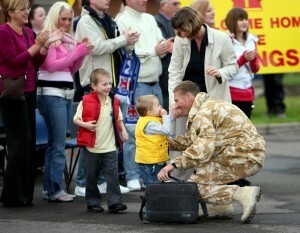 Apply for the Forces Help To Buy Scheme, helping military personnel get on the property ladder. Avoid re-mortgaging to fund your lifestyle. Using mortgage top ups for lifestyle expenses reduces the value of your investment with even more debt to pay off. Television, car, clothes, holidays – so much you’d like to have and the sooner the better. And many offers of loans and credit to buy them now rather than later. Be wary of taking on too much debt. Keep your credit score up to date – make sure you register yourself on the electoral role every time you move. Keep an eye on your credit record through one of the free services such as Noddle. If you don’t, the cost of mortgages and loans (when you do need them) may be higher. Finally, don’t forget the service family federations who are there to help with advice and guidance as you consider your decisions. So, those are the five mistakes as we see them. What has been your experience? Share it with us and our readers!